Get a Referral – Word of mouth referrals are the best way to find a reputable valet company. If you have an event planner, caterer, and/or event rentals company, ask them who they recommend. 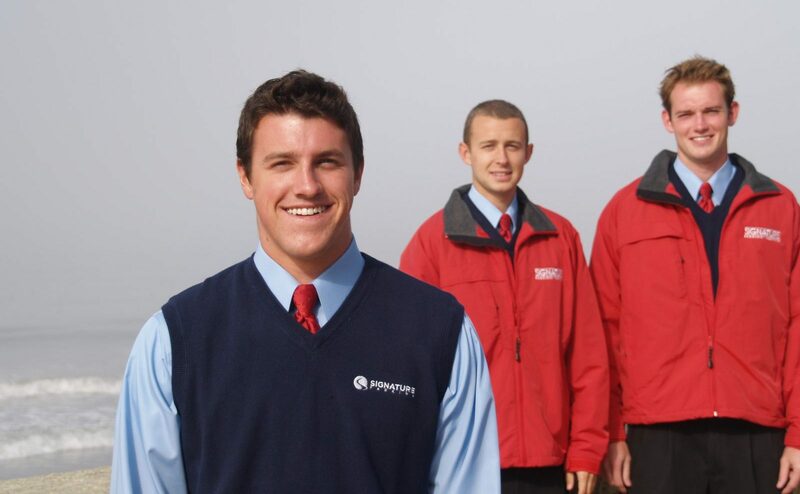 They have a lot of experience working with parking companies and will know who the best is. If you are not using an event planner and caterer – don’t be afraid to pick up the phone and call one simply to get a recommendation. Pure Joy Catering has a great list of reputable event industry vendors on the Central Coast: http://purejoycatering.com/vendors. Request a Site Visit – A good valet company will always offer a free in-person consultation for your event if they are unfamiliar with the location. This is a good opportunity for you to get comfortable with the valet vendor and make sure they seem honest, professional, and reputable. If the company refuses to come out for a site visit or wants to charge you for a site visit, this is a red flag. At a minimum, the valet company should visit the site, give you a brief explanation of how they plan to manage the parking arrivals, where they will park the cars, and how traffic flow will be managed to minimize any backup or delays. Get a Written Estimate – After meeting with your valet vendor, make sure they send you a written estimate which spells out what time their staff will arrive, number of valet staff, and total cost. Most companies charge by the hour and some have a minimum flat rate charge for shorter events. A 3 or 4 hour minimum per valet is commonplace in the industry. Make sure there are no hidden charges or fees, everything should be spelled out. Also, make sure you are only getting charged for hours worked. Shady valet companies will often release valet staff early to cut their own costs, but will still charge you for those staff until the event ending time. You should only pay for actual time worked (over and above the minimums). When in doubt, ask to see a copy of their event report with the invoice. Fully Insured –In the car parking business, accidents do sometimes happen so it’s important to make sure your valet company carries proper insurance coverages. If the valet operator is not insured or is under-insured, you could be held personally liable in the event of an unforeseen accident or injury. While $1 Million dollars is the long standing minimum standard for liability insurance, these days it’s widely viewed as inadequate and most businesses and savvy individuals will demand higher limits to protect themselves. Better valet companies will have an umbrella policy which at least doubles the minimum standard by providing $2 Million dollars or more in liability coverage. Make sure the carrier is “A” rated or better and also carried Workers Compensation coverage for its employees as required by law. Choose Quality – If you are deciding between two companies, beware of the low cost provider. Like anything, you usually get what you pay for, and the same holds true in the valet industry. Low cost providers cannot afford proper uniforms for their employees, provide little or no training, and rely on unskilled laborers who speak poor English. They will also be less likely to step up and pay for damages caused by their own employees, leaving you holding the bag when your guest’s Mercedes gets accidentally dinged up. The larger more well-established valet companies will normally have better systems in place for training, quality control, and employee management. They will also have the financial resources to cover any accidents that may occur.